Rome is a shopper’s paradise; it has everything that one’s heart desires. In particular, the various Italian designer brands are popular and famous all around the world. 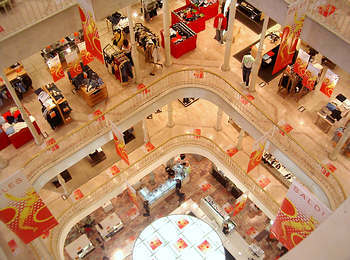 In Rome there are countless designer shops and boutiques. Particularly well known and popular with both locals and tourists, is the designer outlet ‘Castel Romano’. This is an entire shopping centre with over 100 shops and 25,000 square metres where one can buy fashion clothing, shoes and sports apparel and accessories at drastically reduced prices. The shopping centre can be reached via metro- line ‘B’, station EUR Palasport. Every Tuesday and Saturday, a free shuttle bus runs from the Piazza della Rebbublica in the centre of Rome to the shopping centre. It is open daily from 10am – 9pm. The ‘Arsenale’ in the Via del Governo Vecchio 64 is a fashion boutique with the latest trends. It can be reached using the bus routes 64 and 116. Catanella is a Roman boutique-chain for young fashion. One branch can be found at the Piazza S. Sivestro, the other branch is on the Via del Corso 64. Another tip for shopping-addicted tourists is the ‘Discount Alta Moda’. There one can obtain designer fashions for half price. Both shops lie on the ‘Via di Gesú e Maria’ numbers 14 and 16. At no. 14 there is ladies fashion whilst in no. 16 there is men’s fashion. The shop can be reached via the metro – line A, station ‘Flaminio’, or via the bus – route 117. For bargain hunters it is certainly worthwhile to browse through one of the many flea markets. The most famous of these is the ‘Porta Portese’ between the ‘Viale Travestere’ and the ‘Porta Portese’. It is always opened on a Sunday between 7am and 2pm, and can be reached via the Tram – lines 8 and via bus- route 780. There one will find virtually everything. Another well known flea market is the ‘Mercation Flaminio’. It is open on Sundays between 10am to 7pm; a small entrance fee is required to get it. The flea market can be found on the Piazza della Marina 32 and is accessible via the Tram – lines 2 or 19. Two more bits of advice: if you go into crowds such as that at a flea market, one should be wary of pickpockets that operate there. One should also be careful not to buy counterfeit branded goods from street vendors or from flea market stalls. If one is caught by the police, one can expect to face heavy fines that can amount to thousands of Euros; this could make one’s ‘bargain’ the most expensive item of clothing you ever buy!